I’ll not comment here on the extraordinary time we’re living in. (You can read some OpEds at the link below.) Instead, I’m aiming simply to catch you up on climate projects I’ve been working on. I hope to discuss your participation and support as we face the greatest challenge of our lifetimes. I’m flourishing as I recruit collaborators and try out strategies, throwing the most promising ideas against a wall to see which will stick. I’ll be away recharging on the East Coast and Paris until mid-June, but I’ll keep things moving forward from afar. I’d love to hear from you if you’re a potential collaborator, advisor, supporter, or funder. How I got here: In 2009, CalCars welcomed our initial victory on our first-stage goals: mass production of plug-in hybrids like the Chevy Volt. Ever since, I’ve refocused on “missing pieces” in climate change awareness and solutions. I keep comparing notes with entrepreneurs and strategists in tech and other networks and with members and organizers in national policy and activist groups. These include (alphabetically) 350.org, Citizens Climate Lobby, Climate Hawks Vote, Environmental Entrepreneurs, Greenpeace, Plug In America, Sierra Club, Voices for Progress, and some of their local chapters. Elon Musk shake up the Paris Climate Summit to get serious about pricing carbon. Children and spouses of fossil fuel company executives appeal to them for their futures at mealtimes. Some artist or communicator create a galvanizing call to action to awaken millions about climate change. These and other articles are at BeyondCassandra, my temporary project incubator site. ClimateCongress Wikipedia Project started August 2016; launched with many House & Senate incumbents and candidates. Endorsed at its October launch by Bill McKibben and Mike Brune. OUR ASK: Help us energize this before the 2018 election cycle. 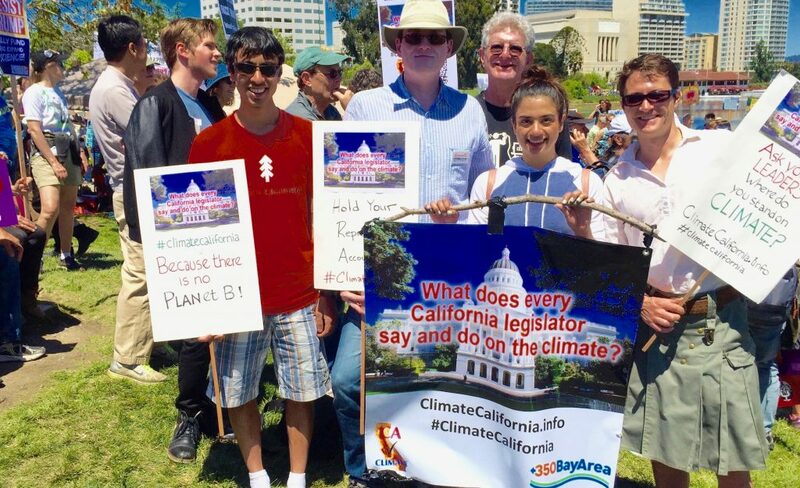 ClimateCalifornia wiki launched in April 2017 with California Assembly and Senate members, tracking key bills. (This letter’s photo features some of our team.) Endorsed so far by four groups including 350BayArea, we’re approaching environmental justice and other partners. OUR ASK: consider supporting this 501(c)3 — ask for our fundraising proposal. ClimatePolitics will bring these two wikis and soon, we hope, other jurisdictions, under a new scalable platform. As we look ahead to 2018 elections, this could become a tool for activists going to Town Halls or other events, reporting what representatives or candidates for any level office say and do on climate. We’ve just gained the ability to harvest and make available climate-related tweets for any officials and leaders— see a sample Senator. OUR ASKS: Consider giving time to organize/expand the project; help us launch a crowdfunding campaign to gain support and visibility. ClimateMBA aims to enlist MBA students and alumni to connect university communities with corporate risk assessment issues. OUR ASK: connect us with MBA alumni who could help; support the project via our first endorser, NetImpact.org (with chapters at over 100 U.S. business schools). Carbon Bubble Resource Center aims to assess the direct and indirect risk profiles of companies and countries as the day approaches when, because of regulations or markets, they can’t extract and burn their reserves. Our founding team is in early stages, including an innovative financing strategy. OUR ASK: let us know if you want to hear more.